This is a blog about the Four Corners area of Silver Spring, Maryland. I write about all things affecting Four Corners; such as local news, events, people, places, and history. For the purposes of this blog, Four Corners is bounded by Northwest Branch & Sligo Creek to the East and West, and Northwood & Wayne Avenue to the North and South. Hope you enjoy the blog! The second annual Silver Spring / Takoma Park Restaurant Week kicked off last night at Not Your Average Joe's restaurant in downtown Silver Spring. Restaurant week began yesterday, September 6, and runs through Sunday, September 11. Restaurant week was organized by Councilmember Tom Hucker's office to showcase the diverse array of restaurants in Silver Spring and Takoma Park. 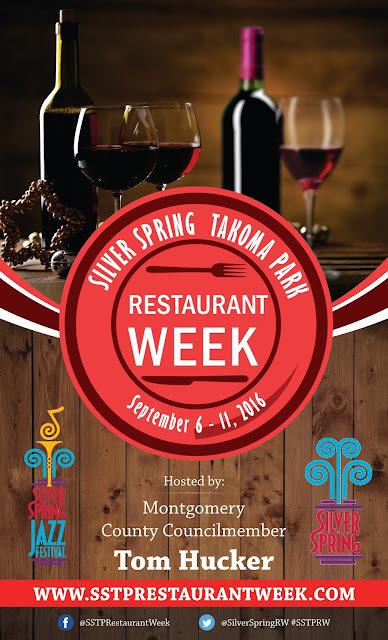 During Silver Spring / Takoma Park Restaurant Week, participating restaurants will offer two-course lunches for $12 and three-course lunches for $17. Two-course dinners will be available for $17 and three-course dinners will be offered for $27. In the words of Councilmember Hucker, “The participating restaurants encompass the diversity of cuisine and culture that embody modern Silver Spring and Takoma Park—Cuban, Mexican, Ethiopian, Chinese, Korean, Nepalese, Vietnamese, Middle-Eastern, American and so much more. At such affordable prices, residents and visitors have a great incentive to come to Silver Spring and Takoma Park for the first time or for regular diners to try something new." There are 32 restaurants participating in this year's Restaurant Week. While there aren't any restaurants in Four Corners participating this year, hopefully the success of 2016 restaurant week will incentivize some of our great local establishments to join the event next year. 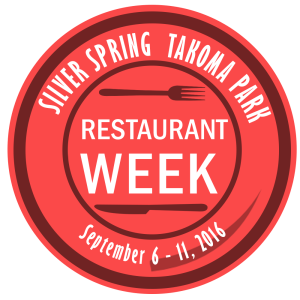 The 32 participating restaurants are listed on the Silver Spring / Takoma Park Restaurant Week website with links to their respective sites and menus. Diners can also connect with businesses and fellow attendees on Twitter @SilverSpringRW and on Facebook @SSTPRestaurantWeek. This event is a great way to celebrate the communities of Silver Spring and Takoma Park, and it represents excellent collaboration between the business community, nonprofits, and local government. There's something for everyone at restaurant week, so check it out and enjoy some good food! Things to do in Mystic CT: The best things to do in Mystic CT, including events, romantic weekend, family fun, festivals, mystic ct family vacation, attractions, tours, free activities and entertainment. Groton CT is a shoreline community in southeastern Connecticut located between New York and Boston. Groton is home to restaurants, bars, beaches and much more. Could Woodmoor have a dog park? Like Around The Corners on Facebook!